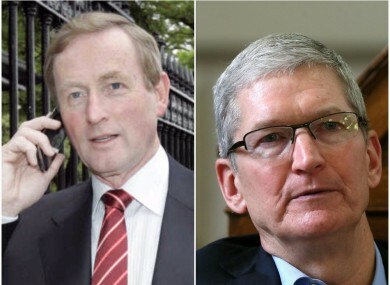 TAOISEACH ENDA KENNY spoke to Apple CEO Tim Cook before the bombshell tax announcement yesterday. It’s been confirmed that a phone call took place on Sunday at the request of Cook. The Apple boss is understood to have told Kenny that he is committed to operations in Ireland and equally expressed support for Apple’s presence in the country. Today, the Cabinet failed to reach a decision on whether to appeal yesterday’s landmark ruling that Ireland is owed at least €13 billion in back taxes from Apple. A recall of the Dáil could now be likely with government sources indicating there are no objections or aversions to it. Finance Minister Michael Noonan sought Cabinet approval to appeal the ruling that Ireland gave Apple illegal State aid. Noonan and the Attorney General today briefed ministers on the contents of the 150 page ruling, which has yet to be published. During today’s meeting, the Independent Alliance called for a strong statement on tax policy in exchange for backing an appeal of the European Commission’s decision on Apple. It’s understood no other international companies other than Apple were discussed at the meeting today, however, there were detailed exchanges of views in terms of what it all means in the broader sense of foreign direct investment in Ireland. The meeting lasted just under four hours in Government Buildings, resulting in no agreement. Cabinet is to reconvene again on Friday at 11am to secure a united government position on the matter. The government says that the decision was taken to adjourn until Friday so as to allow members “reflect on the issues and to clarify a number of legal and technical issues”. The Attorney General and her officials are to be consulted so they can clarify what grounds for appeal exist. It is understood that the government’s current viewpoint is that the Commission is prioritising competition policy over tax policy. This could form the basis of an appeal. If appealed, the process could take up to four years. Government sources said it would not be “cavalier” or “complacent” about employment in Ireland. “Mass unemployment is immoral… we are not about to be irresponsible in the short-term,” a source said. Assertions have been made that Ireland did “something illegal – we refute that”, they added. Sinn Féin is opposing moves to appeal the judgement and has also called on the Independent Alliance to “stand up for taxpayers” by doing the same. The Labour Party has said that it would support a government plan to lodge an appeal so that “this matter can be determined by the European Court of Justice”. The Green Party has said that appealing the ruling would be “immoral” because Ireland must “play its part” in ensuring that “tax havens are not acceptable”. Other parties, such as AAA-PBP, have said the €13 billion could be used to address the homeless and housing problems. A government spokesperson said the ”money is not available”. He added that Ireland remains an enthusiastic and engaged member of the EU and will remain so. However, he said Ireland would also continue to defend its tax system. Email “Taoiseach spoke to Apple CEO before bombshell tax announcement ”. Feedback on “Taoiseach spoke to Apple CEO before bombshell tax announcement ”.